On November 3, 2016, 33 year-old Antonio Madeam of the 1600 block of Ruxton Avenue was shot in the 1800 block of Ruxton Avenue. He was transported to Shock Trauma where he remained in critical condition until he died on November 8, 2016. Relative to this murder investigation, homicide detectives are looking to identify the three individuals shown in this photo. 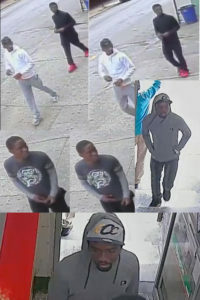 Anyone with information as to their identities are asked to call Metro Crime Stoppers at 1-866-7LOCKUP. Callers will remain anonymous.